Camping is a great way to explore Europe. If you are looking for inspiration for your summer adventures, mum of 3 Jan shares her experience camping in the Basque region of northern Spain. Itxaspe campground is located in the Spanish Basque Country between San Sebastian and Bilbao. 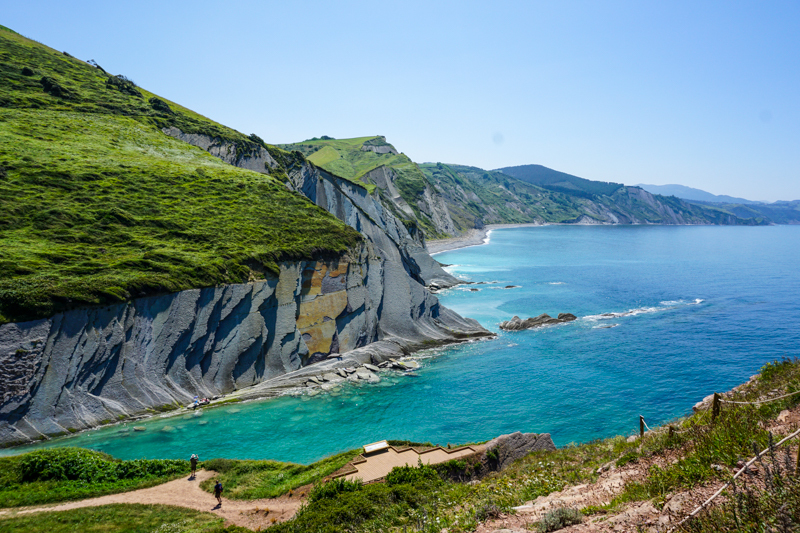 It is situated in the UNESCO-designated Basque Coast Geopark, a lush and rugged coastal area characterised by stratified cliffs called "flysch". The trip from western Switzerland took us about 11 hours by car, which we did over two days. We travelled west across France to Bordeaux, and then followed the coast into Spain and to the campground, which is not far from the highway. Despite traveling on a summer Saturday, we had no traffic issues. The campground is in the countryside, so a car is necessary if you want to get around easily. There are some public transit options nearby (bus and train), but they require a bit of a walk from the campground to the town of Itziar. The terrain is rugged and steep, so biking is not practical if you have small children. The campground offers three different sizes of campsites, indicating which one you should book based on the type of equipment you will have (small or large tent, van or caravan). You can request electricity for an extra fee. A couple of the other families we spoke to complained about the sites being small, but we have never been to a campground in Europe where the sites were NOT small. Not all sites can accommodate both a tent/trailer and a car, so there is parking just outside the campground gate where you can park your car if necessary. However, whatever the sites lacked in size, they made up for with the view, which is amazing! The sites situated at the eastern edge of the campground have the best views (we had site I08 with an unobstructed view of the coast). There are a number of bungalows available, many of which looked brand new and gorgeous. There are also a few apartments for rent in the main building. Bathrooms, showers, laundry and dishwashing facilities are located in two buildings servicing different parts of the campground. One of them offers a dedicated children's washing area, with adapted showers, sink and toilets. The showers are free. There is a small grocery store in the reception area, but no fresh produce. The campground offers a barbecue area with about a dozen barbecues, as well as a simple restaurant. The campground has a gorgeous infinity pool with great views of the coast and surrounding countryside. The maximum depth is 1.20m, and there is a very gentle slope leading into the pool, so it's perfect even for small children. There is also a large play area with a playground, pingpong tables and a football pitch, which is set away from the campsites. There are a couple of smaller play areas dispersed amongst the campsites (one was right in front of our site, which was handy). We mostly cooked our own food on our camp stove, and used the barbecues a few times. The grocery store was practical for buying some non-perishables, but we tended to shop while we were out during the day. Not wanting to miss out on the delicious Spanish food (tapas! ), we ate out a few times—for lunch while we were out visiting, and in the evening at the campground restaurant. We were so impressed by the Geopark that we rarely ventured far from the campground. The coast is very rugged but dotted with little villages and beaches, and we'd pick one to visit each day. 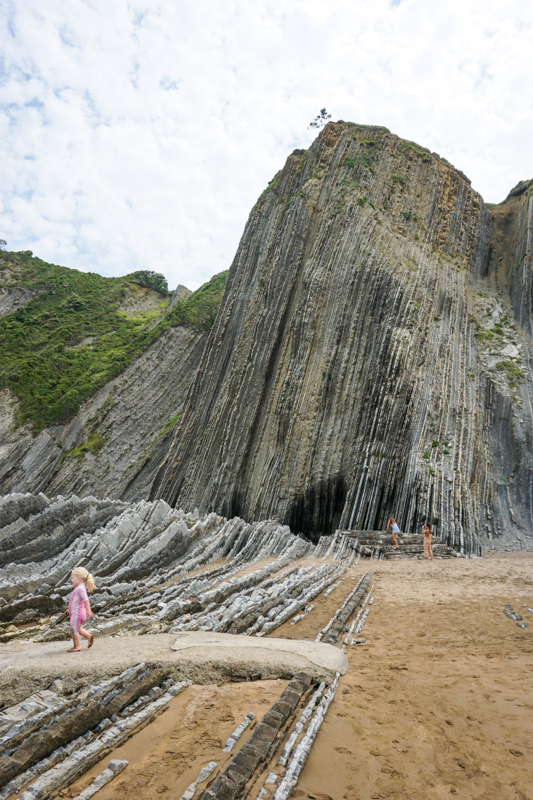 We particularly loved Itzurun beach in Zumaia, and spent two full days there. There is also a great beach in Zarautz. The campground is situated on the GR121 hiking trail, and I would have loved to hike the entire coast, but our kids only allowed us to do a few short walks. The day trip possibilities are endless. We did just one, and spent a cloudy day in Bilbao visiting the Guggenheim. Our kids loved it and affectionately called if the "craft museum". We didn't make it to San Sebastian, but a lot of other families we met did go. There is a large aquarium there, which we'd reserved for a rainy day, if needed. Rain gear. The Basque Country is very lush and green for a reason: it rains a lot. We didn't get much rain, but had a couple cloudy days. The weather remained warm so it didn't bother us or prohibit us from getting out. The campground is popular and not very large, so it's essential to book ahead. We booked in January through the campground's website. There is a 7-night minimum when booking in advance (the reservation site offers different date possibilities). However, we intended to stay only six nights, so they offered to remove a day when we checked in, as they never have trouble filling the spots. Its surroundings and views. The Geopark where the campground is located is spectacular and took us completely by surprise. The Spanish Basque Country had been on our travel wish list for a few years, so I'd already done quite a bit of research, but none of my travel guides made more than a passing reference to the park and the amazing vertical stratified cliffs that define it. Our girls are at an age that makes visiting cities or historic sites nearly impossible. The landscape surrounding the campground was so unique that we didn't feel that we had to constantly get out and visit things, and we didn't do half of what we'd intended to do. We simply enjoyed the campground, the beaches and surrounding areas and had a wonderful, relaxing holiday. Also, the staff were very friendly and helpful, and seemed genuinely invested in ensuring their guests made the most of their time in the Basque Country. They all clearly love the area and eagerly shared their local knowledge. We are a Canadian/French family of five: Jan, a librarian, Pierre, a scientist, and our three girls aged 3, 5 and 8. I (Jan) am Canadian and grew up camping in Canada’s national and provincial parks. While very different from the camping experience in Canada, we love that campgrounds in Europe allow us to combine travel and camping. Each summer we spend at least part of our summer vacation camping in our large, multi-room tent. LOOKING FOR MORE INSPIRATION? CHECK OUT OUR EVER GROWING LIST OF CAMPGROUND REVIEWS AND CONTRIBUTE YOUR OWN HERE.